Past Forward: Let your memories live on. | Memoirs and organizational histories created by award-winning professionals. 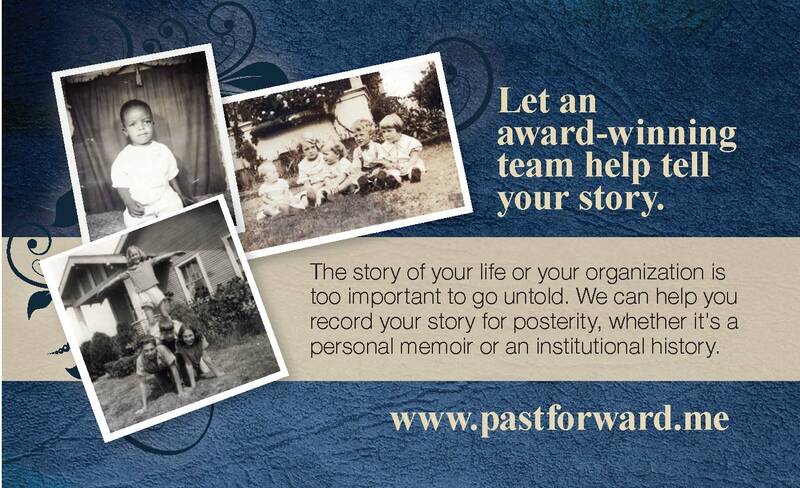 The Past Forward team is ready to work with you. Award-winning veteran reporter Taylor Sisk sits with you for three or four casual conversations about your life and legacy – the historical, the anecdotal, the treasured memories. He then writes the story using your words and in your voice. Next, our designers, Maxine Mills and Tremayne Cryer, choose images from your archives – documents, photos, illustrations – to help tell your story and lay it all out in book form. The result is a beautifully written and bound edition. Past Forward can help you tell your story. Contact us today. Let your memories live on.